How To Design A SaaS Application? SaaS stands for Software as a Service and gives ready-made software to customers via a web browser or mobile app and allows them to simply use the software to solve their problems. There are not only technical differences between SaaS and bespoke application design, there are also philosophical differences. In this article, I will blend business and technical aspects of designing a SaaS application to help you design a more successful product. There are many SaaS solutions to choose from. Before you start developing your own one, you need to completely understand the idea behind your product, how it will look like, what will its functions be. You also have to be aware who your target customers are and why they will want to use the solution, therefore, what will be necessary to help them reach their goals. You should always keep in mind that you want to create something different, something that the future users will enjoy and want to continuously use and recommend to others. Start with thinking about what you are passionate about that has not been created yet or what can annoy SaaS consumers in those existing solutions or even, what annoys you personally. This may bring you ideas for your value proposition which will differentiate you from other solutions. At this point, it is worth to also think about the user experience, customer support and third-party integrations. Maybe those are the things that your competitors are lacking? You should research similar products on the market and understand how you can solve the users’ problems better. 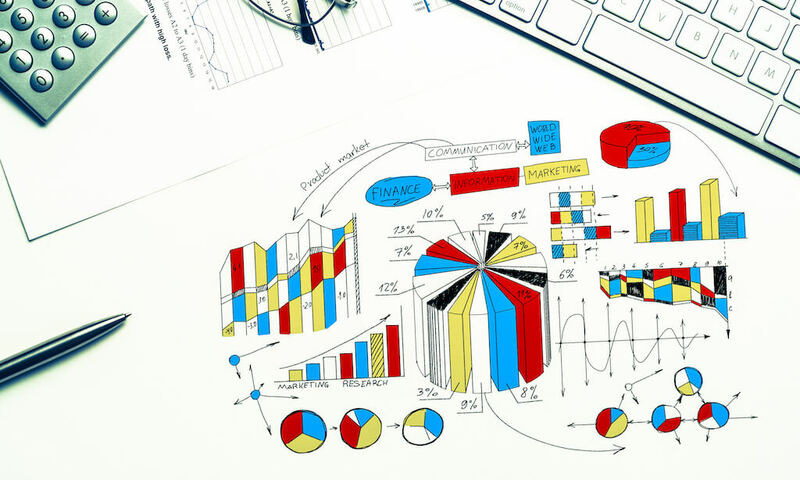 Market research helps to understand whether the SaaS project you are about to delve into has a potential audience as well as to find your customers aches and pains. SaaS companies should focus on showing the value to individual users first, instead of selling to managers or decision makers who will not be using the software on a daily basis. Retaining customers is about continually showing them the values of your product. While developing your SaaS application you need to take into account the average cost that it takes to acquire a customer, and then how much profit the average customer brings in. In other words, you have to consider the customer acquisition cost (CAC) and compare it to the customer lifetime value (LTV). Your aim should be to recover the CAC in less than 12 months. The CAC and LTV will guide you through finding your most profitable and target clients. SaaS solutions have a longer sales cycle in comparison to other businesses. The average length of the sales cycle for Software as a Sevice is close to 3 months. In terms of business, it is a long time to maintain a relationship and convince somebody to buy your product. On the other hand, taking into consideration what goes into the buying process it is no surprise that the customers take their time. You should aim to create a close relationship with your customer in order to start a successful collaboration without looking too desperate. First of all, your potential clients should get acquainted with your business, find out what are you about. In many cases, they will be at the very beginning of their road and may not even be aware that you are what they are missing. The second step would be to engage them with some of your content. Subscribing to a newsletter, getting downloadable docs is what attracts attention. In the next two steps, your consumers should explore your offering and hopefully convert into a paying subscriber. You can make use of organic traffic by creating a SEO strategy, building your brand on events and showcasing your product on paid advertisements. Those activities will be based strictly on your target audience, but it is the best option to implement them at some point. Your job is to retain customers and keep them coming back for more with exclusive newsletters and discounts for your loyal clients. Creating a supporting atmosphere is also an important part of customer retention. Boost your customer experience with welcoming emails and propose onboarding services to the new ones. Nurture your relationship through regular interactions. Development of SaaS solutions is connected to storing data in the cloud and many new customers may hesitate to do so. With the GDPR laws security of personal data is an even bigger problem, so make sure your product is GDPR compliant. What is special about SaaS applications is the fact that they are self-service. This means that anyone who is interested in a given product can register and start using the service straight away. Users should be able to customize the solution to their requirements and needs. Multi-tenancy means that a single instance of a software application is meant to serve multiple customers and it the key to the success of your system. This is achieved either through separate databases or one database that displays adequate information to particular users. Thanks to that the development will be faster since developers can make use of a previously written code base to expand the service and apply changes. Multi-tenancy also means that the application should be very secure since the infrastructure is shared among all users. Based on those layers, we distinguish four types of multi-tenancy models that you can use to architect your SaaS application. Isolated Tenancy: the most basic level of tenancy where none of the layers are shared among the tenants. 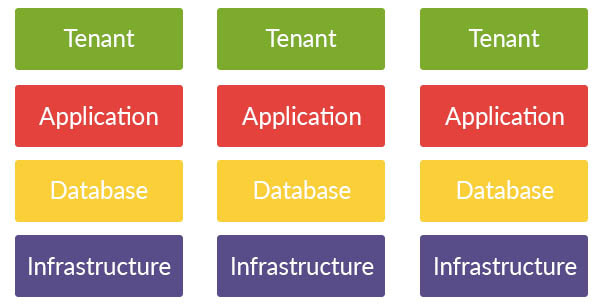 Every tenant has its own infrastructure, application and database. The infrastructure is isolated. 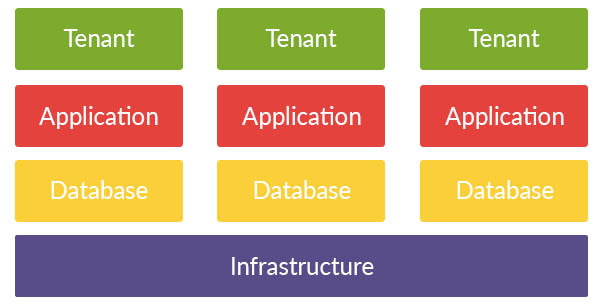 Infrastructure Tenancy: here the infrastructure of the application is shared across tenants while the application and database remain separate. 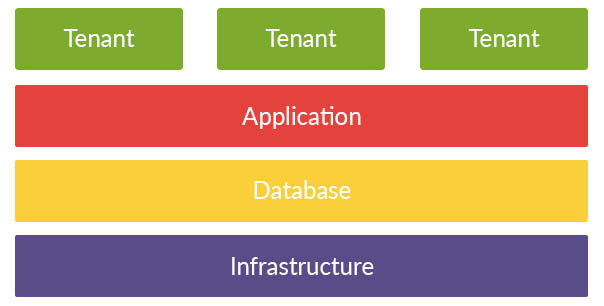 Application Tenancy: the application code and infrastructure are shared among tenants while the database remains separate. 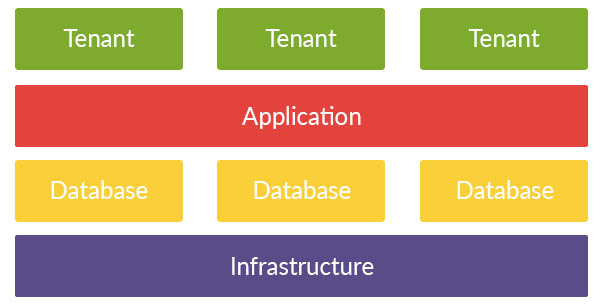 Shared Tenancy: in the last tenancy model, infrastructure, database and application are shared among the tenants but each tenant in the database is considered to be separate. Your SaaS application should also be able to integrate with other services, for example, online payment solutions. Since your system will be available online it should be highly performant. An application with good performance should always be available and able to serve tenants of any size. When designing a SaaS application we have to take into consideration many factors. First of all we should always remember that a good idea comes from proper market research and a well thought out client persona. After the initial process of creation, client acquisition is next. If you manage to acquire customers, it is also important to take care of your relationship by providing support and keeping a conversation going. Finally, your application should be secure and compliant with international restrictions. Multi-tenancy in practical terms is what differentiates Software as a Service from other subscription-based solutions. A well-designed and developed SaaS application brings benefits to both the customer and the developer. Tomasz is a Tech Expert with an enormous experience in both back-end and front-end solutions. He ensures that quality processes and automations are carried out through the whole software development cycle.